The Living Shoreline is comprised of eleven Sculptural Elements that are designed to support the growth of mangroves and emergent grasses, create shelter and passage for fish, and establish oyster reef habitat within the Lake Worth Lagoon in Southern Florida. This concept is an innovative approach to public art in which the artwork is created as an armature to support the regeneration of critical estuarine habitat. The Living Shoreline will ultimately assist in improving water quality, protecting the adjacent bulkhead seawall, public park, and infrastructure (including from early sea-level rise impacts), and it will support the restoration of habitat. 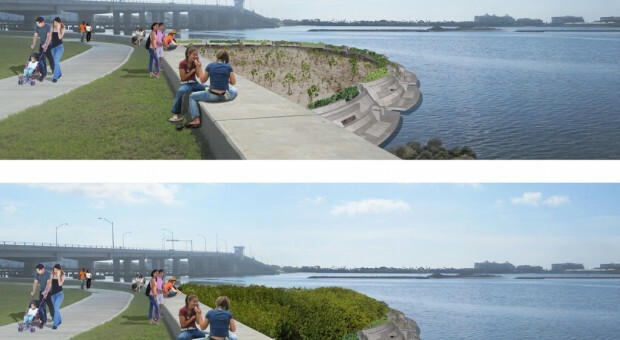 Critically, it will do this in a manner that engages the broader public to witness the regenerative transformation of a barren engineered edge to support shallow water estuarine habitat through a piece of public art. The Living Shoreline is an ongoing collaborative project with the Palm Beach County Department of Environmental Resources Management and engineer of record, Bridge Design. Fabrication is to commence in the fall of 2014 and installation will occur in the spring of 2015. Palm Beach County and The National Endowment for the Arts, Art Works Program.